Spring is in full swing, and I’m already getting excited for delicious, seasonal treats! One of my favorites are these All-Natural Goodpop Frozen Pops. They are unbelievably delicious, and are a great treat that I can enjoy without feeling guilty. Also, because they are made with only wholesome, natural, real ingredients, they are a great snack to share with my kids who are OBSESSED with popsicles. 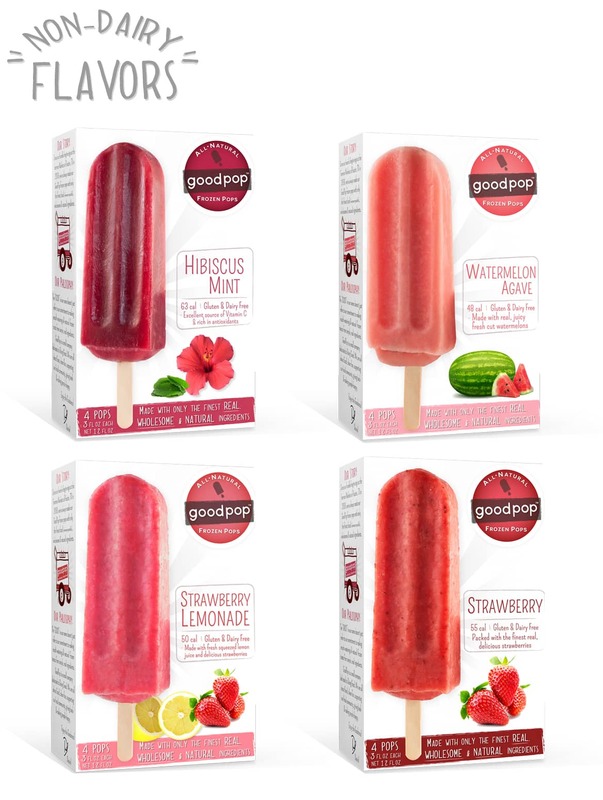 All-Natural Goodpop Frozen Pops range from 1-3 Points each, depending on the flavor. And they come in seven staple flavors: The non-dairy are Watermelon Agave, Strawberry, Strawberry Lemonade, Hibiscus Mint, and the Dairy based ones are Chocolate, Banana Cinnamon, and Coldbrew Coffee…and they are all fantastic!! Additionally, they offer some seasonal flavors like: Pineapple Basil, Mango Chile, Coconut, Pina Colada, and many more! WOW!!!! Seriously, I’m in love with these. Keep reading to learn more…. According to the company that produces them, “Every GoodPop All-Natural Frozen Pop is made with the best all natural, organic and locally sourced (when we can) ingredients we can find. We use lots of delicious fresh fruit, 100% organic and fair trade cane sugar (organic evaporated cane juice) and nothing artificial, ever. We always make our pops in small batches to ensure that perfect, mouthwatering taste.” One look at the ingredient list can tell you that they are serious about making the best frozen pops that they can. Although they are only available in select states, I’m really hoping they’ll be nationwide soon. I got mine at a Gelson’s here in California, but click HERE to see if they are available near you.